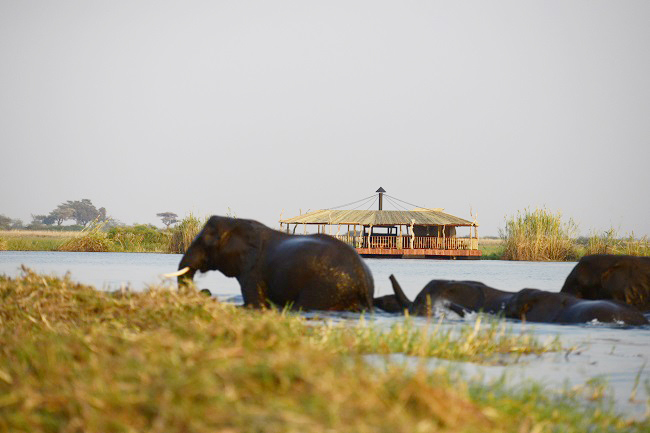 The Raft restaurant is located on the Chobe river. The only floating restaurant in Chobe and a must add to any Botswana itinerary or Chobe Day Trip! Situated opposite Sedudu Island, guests can enjoy Chobe game viewing at its best while savouring the flavours of a traditional “braai” (barbecue). The island, which proudly flies the Botswana Flag, has an abundance of bird life and is frequented by a host of larger herbivors drawn to the endless supply of lush green grass throughout the year. Speaking of green…The Raft has little to no impact on the environment and was built with 90% re-cycled material. All restaurant items are unbreakable with every scrap of refuse being bagged and disposed of off-site. Comments on Trip advisor say it all “Enjoy the view while you eat! “Excellent”.